End of the Summer. Cardinal Timothy Dolan, Archbishop of New York, visited Tagaste Monastery on August 29, 2016, and celebrated a 10:30 AM Mass in the Tagaste chapel together with Fr. Provincial, Michael Rafferty, and Frs. John Gruben, Charles Huse, and John Oldfield. Also present were the presidents of the SAR fraternities of Tagaste, Mr. Joseph Marsico, and St. Cloud, Mr. Joseph Gruszczynski, and Ella Slivka. The Cardinal brought his very informal style to the liturgy, speaking about Sts. Augustine and Monica and asking about the other saints pictured in the stained glass windows, especially Ezekiel Moreno. After Mass all gathered for breakfast and a lively conversation about the Augustinian Recollects and their work in the US and around the world and well as prospective changes in the Order with the upcoming General Chapter. Novena of Guadalupe. Fr. Fidel Hernández presided at the opening of the novena on December 3. The chapel was, as usual, beautifully decorated with a large image of Our Lady and statue of Juan Diego along with an abundance of roses. The rosary was recited each evening along with hymns honoring Mary as well as readings telling the story of the apparition at Tepeyac. After the services, refreshments were served in the hall along with costumed dances performed by the young people of the community. The Feast of Guadalupe (Dec. 12) began with the singing of Las Mañanitas at 5:15 AM with music provided by the Tagaste Hispanic choir and a mariachi group; an evening Mass was celebrated with Fr. Hernández presiding. Annual Guild Communion Breakfast. Around 100 people attended the 9:30 AM bilingual Mass on December 11 celebrated by Fr. Provincial, Michael Rafferty, assisted by Frs. John Gruben, John Oldfield, and Fidel Hernández. Everyone then adjourned to the hall for the breakfast of bacon and eggs, sausage, rolls, and pastries, coffee and tea. Peggy Evans, President of the Pius X Guild, welcomed all and presented each of the friars with Christmas gifts. Door prizes were also distributed. The Guild has been a vital part of the life of Tagaste for over 50 years. Christmas and its Vigil. Frs. Gruben and Hernández were busy with Christmas Eve Masses in the parishes as well as at home, where an 8:00 PM Vigil Mass was celebrated. The Mass was followed by the traditional devotion honoring the Infant Jesus and then by refreshments in the hall. After finishing the Masses on Christmas Day, Fr. Fidel left to begin vacation time with his family in California. New Year 2017. After celebrating the Masses of New Year’s Eve/Day honoring Mary, Mother of God, Fr. Gruben, accompanied by Joe Marsico, former SAR president, joined Fr. Oldfield and the community at St. Joseph Villa in Sloatsburg, NY, for a New Year’s Day lunch. Many of the families of the residents along with Bishop Paul of Stamford, CT, Eastern Rite superior (Ukranian) of the Sister Servants of Mary Immaculate were present for the occasion. As usual, the Sisters put on a worthy feast. On the Solemnity of the Epiphany, celebrated on Jan. 8 in the Archdiocese of New York, the Magi, Mary and Joseph, and several angels joined the procession for the 10:30 Mass and with much splendor, worshiped the new born Jesus in traditional fashion. The “three kings” presented their special gifts at the time of the Offertory . . . That afternoon, some twenty-five SAR members and their families gathered in the fireplace room at 1:00 PM for a truly delicious pot luck lunch featuring lasagna, baked ziti, egg plant parmigiana, sausages and peppers, chicken, ham, and many other items together with an abundance of desserts. The meal began with a procession to the chapel, a reading of the Epiphany story, and a return to the dining room with the signing of “We Three Kings” and a number of other Christmas carols. After lunch there was a grab bag and a sharing of Christmas stories among the members. Frs. Gruben and Theresa Giampaglia, the newly- elected Sar president of the Tagaste Chapter, thanked all of our SAR members for being part of our community life and encouraged recruiting of new members. His Eminence Joseph William Cardinal Tobin, C.Ss.R. Welcome to the Archdiocese of Newark! On January 5, 2017, at 7:00 PM, Fr. John Michael Rafferty, Fr. Fredric Abiera, and Fr. Charles Huse joined hundreds of priests, religious, as well as bishops and cardinals, welcome the new Cardinal of the Archdiocese of Newark, His Eminence Joseph William Cardinal Tobin, C.Ss.R. The evening started with the Solemn Vespers at The Cathedral Basilica of the Sacred Heart in Newark. Cardinal Tobin gave an encouraging and inspiring homily, with a sense of humor as well. After the Solemn Vespers, Cardinal Tobin took time to greet those present. From the Diocese of Sacramento. “So I exhort the presbyters among you, as a fellow presbyter and witness to the sufferings of Christ and one who has a share in the glory to be revealed. Tend the flock of God in your midst, not by constraint but willingly, as God would have it, not for shameful profit but eagerly. Do not lord it over those assigned to you, but be examples to the flock” (1 Pe 5, 1-3). The invitation that the Prince of the Apostles directs to those responsible of the Christian communities found in the Servant of God Alphonse Gallegos a quick and generous response. With enthusiasm and concretion for his sheep he was an authentic image of Christ, the Good Shepherd and an incredible witness of his love for the little ones and the poor. The Servant of God was born in Albuquerque, New Mexico (United States of America) on February 20, 1931 in a deeply religious large family. The high point of his daily life was the recitation of the Rosary. From the moment of his birth, Alphonse manifested two physical characteristics: a severe myopic condition which would be with him throughout his life, and an expressive smile that would illuminate his face. As a consequence of the grave economic situation of the times, the family moved to Watts, a suburb of Los Angeles, in California. Here, the Servant of God would commit himself more deeply in parish activities and, in spite of his vision problems, he was an excellent student. Upon realizing that he felt pulled towards religious life, he entered the Order of the Augustinian Recollects. There he made his profession on September 3, 1951, being ordained to the priesthood at Tagaste Monastery (Suffern, New York) on May 24, 1958. He held various positions, such as hospital chaplain, Master of Novices and pastor in Watts at the Church where he grew up, favoring the development of the permanent diaconate. During these years he underwent surgery to help stop the total blindness which threatened him, thus partially gaining his eyesight. The suburb of Watts was well known for its poverty, margination and pervasive crime. In this context, the main concern of this Servant of God was the formation of children and youth and the proposal of alternative experiences thus replacing the criminal gangs to which many fell prey to. This is why he became friends with the lowriders, the drivers that on weekends would show off on the streets and highways. Because of his pastoral commitment he was appointed the first Director of the Office of Hispanic Concerns of the Bishops’ Conference of California. 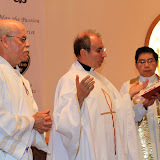 Here he developed a heavily active pastoral ministry on behalf of the migrants, especially along the border dioceses between Mexico and the United States. In the meantime, he had also been appointed pastor of Cristo Rey Parish in Los Angeles. On November 4, 1981, he was appointed Auxiliary Bishop of Sacramento, in California. In all these phases of his life and ministry, the Servant of God, was known for a great simplicity and humility and for a constant joy, even in the midst of sufferings, his patience with which he faced head on the limitations of his eyesight and his kindly treatment of others: all human virtues which harmonized so well with his faith experience. His faithfulness to his religious and priestly vocation found a solid foundation in prayer; it was to prayer that he had dedicated his time and love since childhood. The liturgical celebration and the eucharistic adoration were the most intense nourishment of his life every single day and the permanent fountain of grace for his apostolate. He always nourished a fervent and affectionate devotion to the Virgin Mary, whom he invoked, especially under the title of Guadalupe. He always maintained a very close spiritual relationship with the Augustinian Recollect Family, even when his ministry to the Church would take him to places where there were no convents or monasteries that belonged to the Order. His commitment to the poor was steadfast and generous, always attentive to the needs of each person and of entire communities. He was decisively committed toward the hispanic workers and migrants, who looked for a better life in the United States, uprooted from their original environment, and were easy victims of opression and injustices. His voice was always loud in defense of the unborn and the service of those in most need, above all in the not so easy mission of organizing the apostolate of the hispanics of California. The Servant of God died on October 6, 1991 in a highway accident, leaving an indelible memory in all who found in him a solicitous and faithful pastor, especially when they were physically or spiritually in pain. By virtue of his reputation of holiness, between December 4, 2005 and November 5, 2006, in the ecclesiastical Curia of Sacramento, his diocesan cause was celebrated and its legal validity was recognized by this Congregation with decree of July 4, 2008. Once the Positio was elaborated, following standard procedure, it was discussed if the Servant of God exercised the virtues with heroic degree. And, on March 17, 2016, with a positive outcome, there was a unique meeting of Theological Consultors. Later, in an Ordinary Session, which I, Angelo Cardinal Amato, had the pleasure of presiding over on July 5, 2016, the Cardinal Fathers and Bishops recognized that the Servant of God exercised with heroic degree the theological virtues as well as the cardinal ones and other related virtues. Finally, and after the Cardinal Prefect, undersigned, gave a detailed account to His Holiness Pope Francis, and after having the proper voting at the Congregation for the Causes of Saints, on this day, His Holiness has declared: That for the case and its relevant effects, there is record that the Servant of God Alphonse Gallegos, of the Order of Augustinian Recollects, Auxiliary Bishop of Sacramento, has exercised with heroic degree the theological virtues (faith, hope and charity toward God and neighbor), as well as the cardinal virtues (prudence, justice, temperance and fortitude) and other related virtues. And it is His Holiness who has mandated that this decree be made public and it be promulgated in the proceedings of the Congregation for the Causes of Saints. Given in Rome, on the 8th day of July in the year of Our Lord 2016. Marcello Bartolucci, Titular Archbishop of Mevania, Secretary.